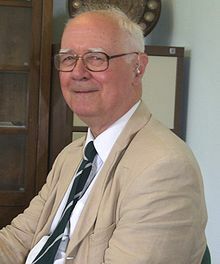 John Polkinghorne (16 de octubre de 1930, Weston-super-Mare, Inglaterra) es un físico y sacerdote anglicano, presidente de Queens' College, de la Universidad de Cambridge, y ex profesor de Física Matemática en Cambridge. Ha publicado numerosos artículos sobre física elemental teórica en revistas científicas y dos libros de carácter técnico y científico, The Analytic S-Matrix (CUP 1966, junto con RJ Edén, PV Landshoff, y Di Oliva) y Models of High Energy Processes (Modelos de Procesos de Alta Energía) (CUP, 1980). Polkinghorne renunció a su cátedra de física para estudiar para el sacerdocio anglicano. Después de completar sus estudios teológicos, ordenarse y prestar servicio en varias parroquias, regresó a Cambridge. Durante ese tiempo, escribió una serie de libros sobre la compatibilidad de la religión y la ciencia. Algunos de sus libros son Science and Creation (Ciencia y Creación), Science and Providence (Ciencia y Providencia), y sus Gifford Lectures, The Faith of a Physicist (La fe de un físico). John Polkinghorne, Nicholas Beale (2009). Questions of Truth: Fifty-One Responses to Questions about God, Science, and Belief. Westminster John Knox Press. ISBN 9781611640038. John Polkinghorne (2011). Science and Religion in Quest of Truth. Yale University Press. ISBN 9780300178395. — (2008). Science and the Trinity: The Christian Encounter with Reality. Yale University Press. ISBN 9780300153538. — (2008). Faith, Science and Understanding. Yale University Press. ISBN 9780300130676. — (2010). One World: The Interaction of Science and Theology. Templeton Foundation Press. ISBN 9781599472003. — (2011). Science and Providence: God's Interaction with the World. Templeton Foundation Press. ISBN 9781599470849. — (2011). Testing Scripture: A Scientist Explores the Bible. Baker Books. ISBN 9781441237408. — (1998). Beyond Science: The Wider Human Context. Cambridge University Press. ISBN 9780521625081. — (2009). Theology in the Context of Science. Yale University Press. ISBN 9780300156096. — (2009). Science and Creation: The Search for Understanding. Templeton Foundation Press. ISBN 9781599472164. — (2002). Quantum Theory: A Very Short Introduction. Oxford University Press. ISBN 9780191577673. — (1980). Models of High Energy Processes. Cambridge University Press. ISBN 9780521223690. Polkinghorne, J. C. (2000). Ciencia y teología. Editorial Sal Terrae. ISBN 978-84-293-1349-9. — (2007). Explorar la realidad: la interrelación de ciencia y religión. Editorial Sal Terrae. ISBN 978-84-293-1700-8. — (2007). La fe de un físico: reflexiones teológicas de un pensador ascendente. Editorial Verbo Divino. ISBN 978-84-8169-747-6. Nelson, Dean; Giberson, Karl (2011). Quantum Leap: How John Polkinghorne Found God in Science and Religion. Monarch Books. ISBN 9781854249722. Christopher C. Knight, Fraser Watts, ed. (2012). God and the Scientist: Exploring the Work of John Polkinghorne. Ashgate Publishing. ISBN 9781409461715. John Marks Templeton, K. S. Giniger, ed. (1998). Spiritual Evolution: Scientists Discuss Their Beliefs. Templeton Foundation Press. ISBN 9781890151164. Woodruff, Michael J. (2001). «Review of John C. Polkinghorne works». Journal of Law and Religion 16 (2): 931-943. doi:10.2307/1051755. Harris, Lyndon F. (1998). «Divine Action: An Interview with John Polkinghorne». CrossCurrents 48 (1): 3-14. ↑ Smith-Moran, Barbara (2008). «Review of Exploring Reality: The Intertwining of Science and Religion». Anglican and Episcopal History 77 (1): 106-108. ↑ Tolley, Michael J. (2003). «Review of The God of Hope and the End of the World». Utopian Studies 14 (1): 249-251. ↑ Davis, Edward B. (1998). «A God Who Does Not Itemize Versus a Science of the Sacred». En Polkinghorne, John. American Scientist 86 (6): 572-574. ↑ Numrich, Paul D.; Numrich, Robert W.; Rolston, Holmes (2000). «Review of Belief in God in an Age of Science, ; Genes, Genesis and God: Values and Their Origins in Natural and Human History, Holmes Rolston, III; The Genetic Gods: Evolution and Belief in Human Affairs». Journal for the Scientific Study of Religion 39 (2): 247-249.